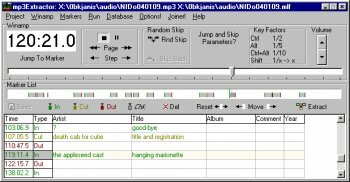 Mp3Extractor is a tool for copying several selected portions from an MP3 into new tagged MP3's. Listen to your material through Winamp and find the portions, parts or tracks of interest that you want to cut out. As you go along, drop virtual markers at the desired start and stop times of these takes and optionally add track information. Mp3Extractor can take Winamp under remote control: Through its interface you can not only set, but jump to, check, and fine tune marker positions (down to a tenth of a second). All this can be done very swiftly by using a elaborate scheme of keyboard short cuts.